Sage 300 ERP has a feature to place invoices on hold, if for any reason they shouldn’t get paid. It’s easy to do while creating an invoice, and once the invoice is posted, one can use the Control Payments screen to place the posted invoices on hold, or to remove the hold status. Occasionally, we have clients ask us why the registration screen of our Sage components (such as National Account Change and Employee Number Change) keeps popping up after they are installed successfully on the server. For an Intacct Platform Services developer, a best practices is to validate all user input before it is saved. The reason is obvious: people make mistakes and data validation can help eliminate user errors. So, here is how I use a validation trigger to validate user input. After Sage 300 ERP upgraded to SAP Crystal Report 2011, several changes appeared for developers and end users. Here are some interesting differences I found comparing version 6.0 and 6.1 besides the logo, icon picture and control name changes. You may already notice that the big Close button at lower right corner is removed. Last week Joe showed us how to update a record name field with a trigger in Intacct Platform Services (see blog). There is another way to do this in Intacct Platform Service. 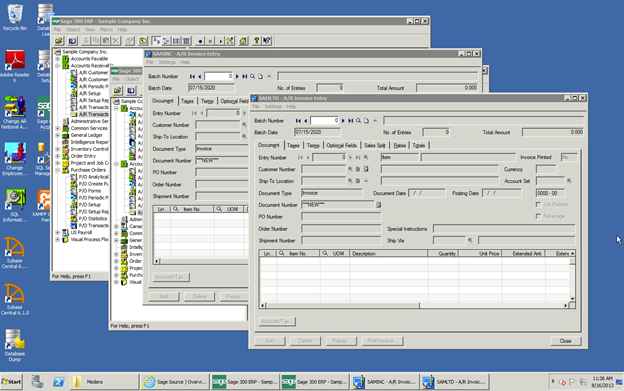 If you have many companies defined in Sage 300 ERP, and have to work on several of them at the same time, it may get confusing which company relates to a particular screen. Look at the screenshot below.